Large visible water surface with special LOD algorithm: the vertex grid is projected to be always in front of the camera. The demo implementation that was developed during the work on this thesis was implemented using the implementation suggested in Section 3.1.3. It was implemented using DirectX 9 and the target platform is the ATi R300-class of GPUs (Radeon 9500 or higher). The animated Perlin noise is rendered on the CPU. The base resolution of each octave is 32x32 pixels and four octaves are stacked together in texture chunks with the resulting resolution of 256x256 pixels. Two of these chunks were used for a total of 8 octaves of noise. The plane was forced to the xz-plane for simplicity’s sake. The vertices were (at default) calculated at a grid with the resolution of 65x129 vertices, resulting in 64x128x2 triangles. The line-plane intersections were only done at the corner vertices, the rest were interpolated using homogenous coordinates. The height-data was read by linear interpolation (but without mip-mapping) on the CPU before the vertex buffer were uploaded to the GPU as world-space coordinates. The two chunks of Perlin noise was uploaded to the GPU and the same height map was generated on the GPU but with the resolution of 512x1024 pixels. Aliasing was avoided by using mip-mapping. The normal map was generated from and at the same resolution as the height map. 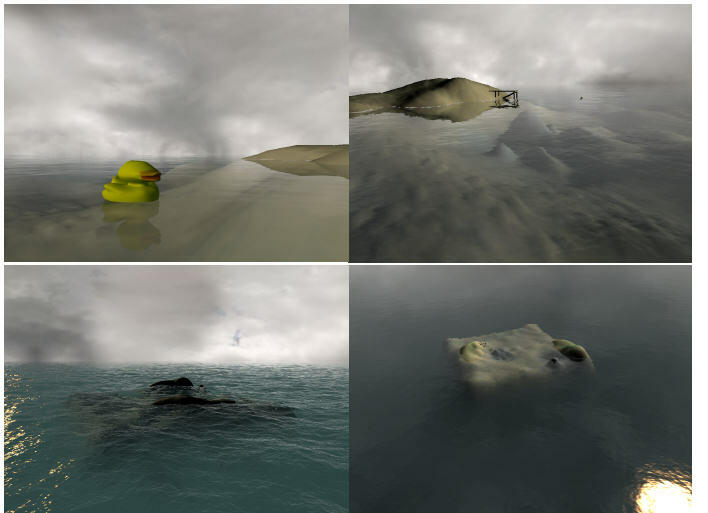 A simple demo scene consisting of an island and a moving rubber duck was mirrored against Sbase and rendered to a texture for use as local reflections. The alpha channel was later used to determine which parts of the texture that was transparent. A sky dome, the demo scene and the water surface was rendered to the back-buffer. Using the normal map and the view-direction (at every point, not just the direction of the camera) the reflection vector was calculated. Using a cube map texture read the reflected part of the sky was sampled (RG). The Fresnel reflectance (f) was obtained by doing a 1D texture read of the dot-product of the reflection vector and the normal. The sunlight contribution (RS) was calculated with phong shading using the normal map and a lightdirection vector. The local reflections (RL) was approximated (cannot be done properly without ray tracing) by offsetting the texture coordinate with the xz-part of the normal. A simpler implementation for the Nebula2 engine was also created. It’s named nPGwater and should be available at the same location as the DX9-demo. It uses per-vertex normals and has no local reflections but is otherwise similar to the DirectX 9 demo implementation.